This was one of my early posts in this blog. I’ve updated it to reflect both changes in my posting style and substantial improvements in available data. 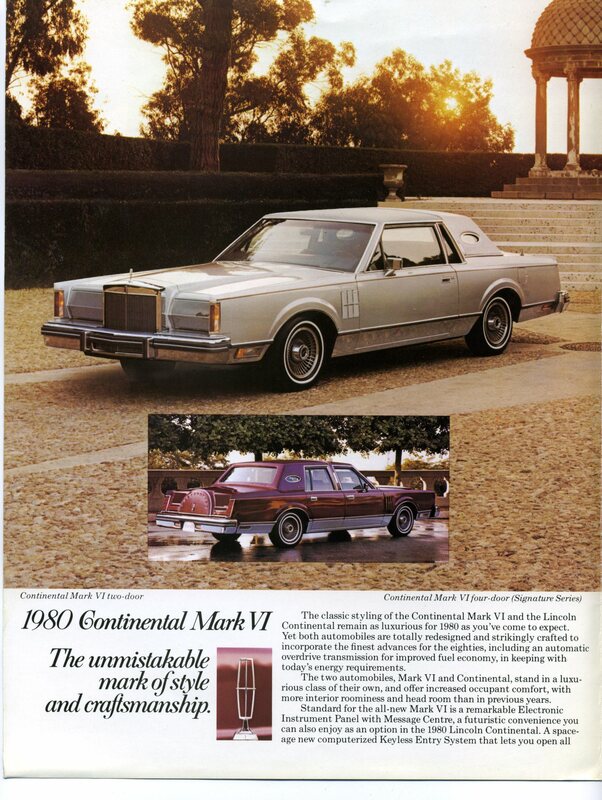 The Lincoln Continental Mark VII was all new for 1984. The standard powertrain for 1984 was a Windsor 140 bhp 4.9 liter/302 ci V8 with throttle-body fuel-injection connected to a four-speed automatic transmission. Despite the LSC’s 3,600 pound weight, 0-60 still came in under 9 seconds. Mileage by the standards of the day was 17 city/22 highway (14/20 by today’s standards). With a 22.3-gallon fuel tank, a Mark VII owner could expect a range of 340 to 390 miles with a 10% reserve. Standard mechanical equipment on all Mark VIIs included four-wheel disk brakes, four-wheel air ride suspension, and the first composite headlights available in the United States. Inside, a Trip Minder computer, air conditioning, rear window defroster, interval wipers, tilt steering, cruise control, remote release fuel door, power windows, power door locks, power side view mirrors, power six-way driver’s seat, and an AM/FM stereo were all included. The new LSC trim level added about $2,000 to the base Mark VII’s non-trivial $21,707 price (making the LSC start at about $54,400 in 2014 dollars). LSC-specific components included a stiffer air suspension, dual exhaust, leather seats, fog lamps, and P215/65R15 Goodyear Eagle GT radial tires (a size still readily available) on forged aluminum 15 x 6-inch wheels. A Traction-Lok limited slip differential was optional for $95. Continental Mark VII LSC pages from the 1984 Lincoln brochure, linked from the Old Car Manual Project’s amazing brochures section. Ford wanted the LSC to compete with the big BMW (635 CSi) and Mercedes-Benz (500 SEC) coupes, but it seems more likely that most LSC buyers were cross-shopping cars like the Buick Riviera T-Type, the Cadillac Eldorado Touring Coupe, or (horrors!) the Ford Thunderbird Turbo Coupe. I always liked the look of the LSC—I think the stylists combined “traditional” Mark traits such as the rear spare tire hump with Ford’s new aerodynamic direction very effectively. At the time, people complained about the somewhat limited interior room and the quite small trunk for such a large car. The period of the big coupe was beginning to fade, but the LSC was indeed an interesting approach. According to Hagerty’s valuation tools, all the money for a 1984 Continental Mark VII LSC in #1 condition is $9,100, with a more “normal” #3 condition LSC fetching $4,200. Lincoln Mark VIIs show up in the Hemmings Motor News classifieds reasonably regularly—as I write this in July 2014, there’s a Sandstone 1988 LSC with 55,000 miles listed for $8,000. Make mine Platinum Clearcoat Metallic, please.